As I mentioned yesterday, where I am currently living is quite warm and muggy this time of year. As I really dislike over heating, I’ve found a few ways of cooling off. 1) Cold water on your wrists, the back of your neck, and inside of your arms. Then stand in front of a fan, or anywhere with moving air. It doesn’t keep you cool for very long, but it really helps to cool you off at least temporarily. 2) Drink LOTS of cold liquids. Water, of course, is the healthiest. My biggest problem is that after about a glass of water, the taste really starts to bug me. My solution, recently, has been to drop in about a sliced quarter of lemon. It adds enough flavor, and is refreshing, to make the water drinkable. Be sure to have as much ice as possible, too. Needless to say, hot water doesn’t work very well for this. It’s also best to use thinner liquids, at least from my experience. Unless you can get a smoothie. Then always get the smoothy. 3) Find a nice cool wall to lean against. I am really good at this one. A couple of years ago, my bed was right up against a cinderblock wall. It was lovely. The wall was always cold, and so if I got hot in the middle of the night I could just throw off the blankets and rest my back against the wall. That really helps cool you off. 4) Cold showers. They’re wonderful for cooling you down. You might start with warmer water, and then work your way down in temperature. Regardless, there are few things quite so refreshing as a cold shower! But how about you, Fluffsters? Do you have any favorite ways of keeping cool? This entry was posted in instructions, list, real world, Webmaster and tagged instructions, list, real world, webmaster on August 31, 2013 by Webmaster. Last night, I had a… remarkable… experience. In fact, I am remarking upon it. So a friend and I were going to WalMart. And where I am right now, it’s very muggy outside. And so, my friend was very nice, and put the air conditioning up to full blast in the car. It was delightful- by the time we got to the WalMart, I was feeling almost cool! What I hadn’t considered in this circumstance, however, was my glasses. My glasses also got cool in the car. Therefore, when I stepped outside, they instantly fogged up. It was as though my lenses were made of frosted glass. Seriously. When my friend turned around after looking for something in the back of her car, I couldn’t tell. It was actually rather funny. It took my glasses a few minutes to de-fog. Seriously. It also took a bit of the air conditioning in WalMart to completely revert my glasses. So that’s my fluff experience of the week. What about you? This entry was posted in pointless, real world, Webmaster and tagged pointless, real world, webmaster on August 30, 2013 by Webmaster. Yay, it’s almost the weekend! Isn’t that exciting? 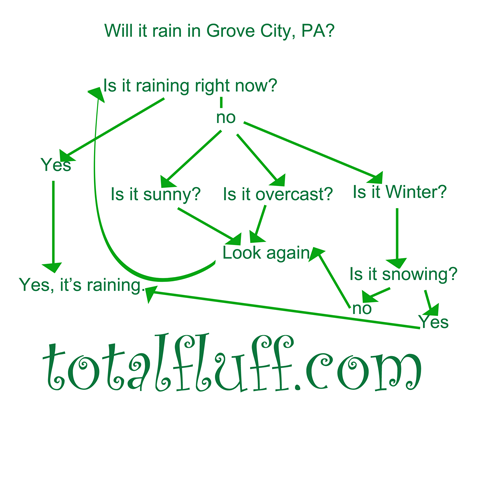 How to tell if it will rain in Grove City, PA.
Actually, I’m just going to make an infographic. It’s easier to see. This entry was posted in real world, Webmaster and tagged infographic, real world, weather, webmaster on August 29, 2013 by Webmaster. Today, I’m talking about orange things that are fluffy. Pretty specific, I know, but it’s what I could think of to do a post on. 5) Mandarin Oranges. Especially when they come out of a can. They’re so sugary, there’s little content to them at all. Hence, they are fluff. 4) “Facts” about mandarin oranges being legitimate oranges. No, they’re not. They’re a completely different type of fruit- don’t try to say otherwise! That’s just fluff. 2) Orange foam. It’s useful for crafts. I could especially see using orange foam for Halloween crafts, can’t you? 1) Orange fluff. This can be ether dyed fiber, a particular type of dessert, or a fleecy fabric. It doesn’t really matter- you can’t beat fluff for being fluffy. There you go, Fluffsters! Happy Wednesday! This entry was posted in list, real world, Webmaster and tagged list, real world, webmaster on August 28, 2013 by Webmaster. Oh, my. My post for this morning didn’t show up- I am REALLY sorry! You bet I did. Webmaster, I did it for your own good. I’m not sure why you thought writing about that topic was a good idea, but you were clearly tired. And with that threat about what would happen if I wrote a replacement post, the best option was clearly to delete it. Oh, it wasn’t that bad, was it? You used the following more than once: its’, lol, OMG, and Pickle Headed Stink-radish. All within the space of a sentence. And you were serious. For the sake of all of us, I hope so too. This entry was posted in Webmaster and tagged webmaster on August 27, 2013 by Webmaster. Today’s post just speaks for itself, so I’m off the hook for writing. Enjoy the following video, and have a great Monday! This entry was posted in Webmaster on August 26, 2013 by Webmaster. 1) The thing you normally think of probably isn’t a tuba. The big circular thing that goes over the person’s shoulder? That’s called a sousaphone. If you only remember one fact remember that! Normal tubas are held. So, again to clarify: These are pictures of tubas. These are images of sousaphones. 2) Sousaphones are marching tubas. As in, they are the marching band’s version of a tuba. The sousaphone players are awesome. Since they wear their instruments, every thing they do gets reflected in the instruments. The sousaphone players also get to wear berets instead of harder hats, because there’s no way a traditional band hat would fit under the sousaphone. 3) Tuba players can do amazing things with their instruments. For example, there is a “dueling tubas” arrangement. This is what it sounds like- “dueling banjos”, done by tubas. So, Fluffsters, do any of you know any interesting tuba facts? This entry was posted in list, music, real world, Webmaster and tagged list, music, real world, webmaster on August 25, 2013 by Webmaster. 1) It gets it off your neck. Especially if you put it up all the way. And not having hair on your neck in the middle of the warm season feels a lot better. 2) It looks pretty. Especially if done well, an elegant bun/braid can be quite pretty. 3) It sometimes gets complements. All right, so that ties in with 2. But it still counts as a separate list item, right? 4) Fewer tangles. If put up well, your hair gets less tangled throughout the day if you braid it and put it up than it would if you just left it down for the entire day. 5) It gives practice, like in case of special events. You know. If you put your hair up a lot normally, you are more experienced at it for events that call for fancy hair styles. 1) How many Bobby Pins did I put in again? Especially if you have thicker / curlier hair, it’s easy to misplace a bobby pin or three. It might be rediscovered in the shower later on. Or maybe when you’re trying to sleep that night, and something keeps poking you in the back of your skull. 2) Bad hair days are even worse. If your hair doesn’t cooperate, you don’t just have annoying hair to worry about- you have the loss of your accustomed hair-do. 4) It comes down easily. Especially if you’re having “bad hair day.” One solution is to use copious amounts of hair spray & gel, but then your hair feels crunchy. I actually sort of like the crunch, but it does detract from “softer” looks. 5) If people become accustomed to seeing you with a fancy “do”, it becomes harder to impress people with your hair. My normal hair style, for example, would probably have worked for homecoming and other fancy dances… if I hadn’t turned it into my “normal” style. Of course, I can still do it that way, but it’s not as special. An easy fix for this is to put some sparkles into your hair, or other random accessories that you normally don’t use. But the fact of the matter is that your hair is still basically in the same style as before, and is thus less impressive. 6) Neck Sunburns. Hair provides valuable protection from the sun. So by getting it off your neck, you are exposing more of your skin to the sun, and thus increasing the likelihood of burn. So there you go, Fluffsters! I hope there’s some information you can use to decide whether to put your hair up regularly, or keep it down. This entry was posted in hair, list, real world, Webmaster and tagged hair, list, real world, webmaster on August 24, 2013 by Webmaster. I’m going to talk about one of the things that kept me really busy this past while. You see, I’m part of a large group that was doing stuff recently. We basically finished on Wednesday night, with a talent show. Now, I knew there was a talent show coming up. I really wanted to participate in the talent show. But you see, the problem is that many of my talents don’t quite work as an on-stage talent. All right, I did some singing when I was younger. But the last time I sang a solo was approximately 4 or 5 years ago, and I didn’t know where I could find music or an accompanist at such short notice. So I entered the talent show, prepared to not perform, even though the officers of the organization really wanted people to participate. I mean, really? What guys among the crowd would want to watch me demonstrate hair braiding? And how do you perform writing a paper / Fluff Post on stage? And so, in the audience, I went through and thought about some things I’m good at. I can sometimes make people laugh. I can’t always do this on command, though, and I really didn’t want to set myself up advertising a comedy routine that wouldn’t be funny. Having people expect you to be funny and then not is just annoying. Both to you, and to the audience members. And comedy routines that aren’t funny seem interminable. (Ever hear the phrase “I looked at my watch at midnight, to discover it was only 8:05? Yeah.) So I was glad that I wasn’t up there doing an impromptu, unrehearsed comedy routine that would probably have gone badly. I can make a room messy. That really doesn’t work on stage- it doesn’t come through. Especially when you don’t have any props with you. Spinning. I’m fairly decent at spinning these days. But even so, the spindle sometimes falls, makes loud sounds/etc., and it was not convenient to get the spindle and wool. So that wouldn’t do. I’m sometimes fairly decent at slightly overusing qualifiers to the point of saying practically nothing. But who wants to listen to that on stage? A few slots in, even though I wasn’t on the list, I got called up on stage amid a bit of confusion on the part of the other organizer of the event. And so, true to the name of the skit, I apologized for the lateness of the entry, and for the confusion. I then went on to start talking about how I came up with the idea- you know, hair braiding & makeup (and paper writing) not being good stage talents. And I basically covered all the other things that I mentioned. (Except for the comedy bit. I didn’t want to prep people into thinking I’m not funny- I just didn’t want to raise expectations too high.) Included there were apologies for not having prepared a powerpoint presentation, and for a lack of boring pie charts. Much to my pleasure, it worked. People actually laughed at it! No prep, I didn’t even mention my ability to make a room messy, and people laughed! That’s seriously one of the best feelings in the world. In the end, I concluded with an apology about spending two minutes of their time that they’d never get back (MWAHAHAHA!) and concluded with a final apology for my lack of talent in a talent show. It was really fun, and I only wish I could remember exactly what I said, because I might want to use it again the next time there’s a talent show I can participate in! This entry was posted in real world, Webmaster and tagged real world, webmaster on August 23, 2013 by Webmaster. Good news! Yesterday was my last really insanely full day of the week. I’ve got today and tomorrow basically OFF! Hopefully that means I’ll be able to write a slightly more thought out post at some point. For right now, though, I’m really insanely tired. So I’m going to leave you with an article that I think is nothing but fluff. It’s an article on “secret introversion.” Oooh. So useful. Have you noticed that everybody tries to put other people into a box? We’re told to “think outside the box”, and yet practically everyone, at least where I am, asks “what box do you fit in?” That box might be a Meyers Briggs type, with the INTP/ESFJ bit, or it might be the role-play game bit with lawful->chaotic/good->evil grid, but most people still try to fit you into a box. That article up above is a valid demonstration. I have recently realized that I very likely am an extrovert, if we’re going with the box model, but a number of those categories work on me, too. So you know what, huffington post? I think you’re wrong. You and the other articles are probably wrong. After all, how many “true extroverts” or “true introverts” do you know? Why does it even matter? All right, so it might give you or others some sort of excuse for why you either do or do not want to be with people right now. But does it really matter? Can’t we just accept that different people do things different ways? Stop trying to put me in a box! Speaking of which, I’m going to get off my soapbox now. How about you, Fluffsters? Any fluffy articles you’ve read recently? Or boxes you’ve been pushed into? This entry was posted in Webmaster on August 22, 2013 by Webmaster.